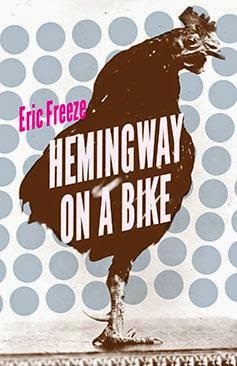 Eric's second book, Hemingway on a Bike, was released last week by University of Nebraska Press. It's a collection of creative nonfiction--essays about raising children, fixing houses, living in France, and playing odd sports. And lots more. A wonderful book of essays, wry and wise, in which Eric Freeze considers what it is to be a twenty-first-century literary man’s man in all his house-remodeling, sweet-parenting, foosball-playing glory. Eric Freeze is the kind of thoughtful writer and parent who will help us save the world. One of my favorite essays is "Supergirl." It's about Eric telling stories to Zari about her superhero-alternative-universe-self who gets zapped by a radioactive jellyfish and gains supersonic flying powers. It's about a little girl's longing to be the hero, to defy gravity, to fly. It's about how being a parent means pouring your heart into silly stories that make your children giggle and stand a little taller at the end of the day. Our crash-and-burn TV interview in London about Zari's "freebirth"
And so much more! You'll laugh! You'll cry! You won't regret it! And even better...if you buy the book from the publisher before the end of October, you get 30% off the list price (and less than Amazon's current price). Ivy is 19 months old!